Agnes loves unicorns and apparently so does Minion Dave. 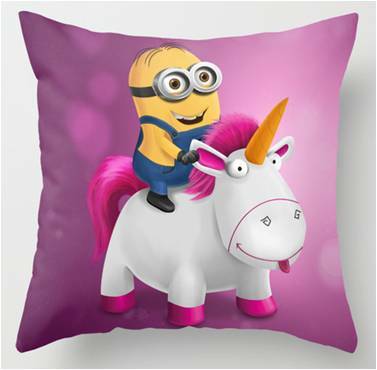 This cute, pink 16-inch by 16-inch Minion throw pillow cover is a premium artisan design with Despicable Me Minion Dave sitting atop the fluffy plush-unicorn that Agnes received at Super Silly Fun Land. This pillow cover measures 16-inches square and is also available in 18-inch and 20-inch sizes. You may order this pillow cover WITH or WITHOUT the insert. Get it as a ready to use throw pillow or get the zippered cover only to wrap your existing “tired” throw pillow that just needs a new look. Featuring the expressive goggle wrapped eyes and innocent smile of a two-eyed, Minion Dave with neatly combed hair, this bright pink and magenta colored PREMIUM pillow has a two-sided artisan design. It comes with a washable poplin cover and concealed zipper for easy removal when cleaning. Agnes’ unicorn looks exactly like the one featured in the Despicable Me film series in bright white shades with hot pink mane, tail and orange horn. Dave is wearing the iconic gray goggles over warm brown eyes with denim colored overalls and a big smile. The background is in shades of light to dark pink and a perfect complement to the Despicable Me themed bedroom of any unicorn loving fan. Should you choose a throw pillow WITH the pillow insert, know the insert is double stitched for quality and over-filled for long wear. Decorating with larger throw pillows provides a much cleaner look than a jumble of smaller ones. Bright colors on a tightly woven fabric like poplin can add just the right splash of color to brighten any room. Consider a large unicorn throw pillow to snuggle in for a nap, to use as a floor pillow for watching TV or playing video games or to have it double as a reading pillow to encourage kids to read their favorite book. This is a single 16-inch by 16-inch, pink Despicable Me unicorn and Minion throw pillow that consists of a zippered, removable cover ONLY and does NOT include the hypo-allergenic down alternative pillow insert. It features a goggled two-eyed Minion Dave atop Agnes’ unicorn in an artisan design on BOTH SIDES of the pillow cover. The unicorn pillow cover is made from 100 percent spun polyester poplin making it very durable yet removable for cleaning — it features a convenient, concealed heavy duty nylon zipper. For cleaning, simply unzip and remove the cover from your pillow. You can pretreat any stained or soiled areas with a color-safe spot cleaner or spray. You may also use a damp sponge to remove any stains. Wash the pillow cover in cold or warm water using a mild detergent. Using bleach is not recommended. Allow the pillow cover to air dry or tumble dry on a low setting. This 16-inch by 16-inch throw pillow cover is available in 18-inch by 18-inch and 20-inch by 20-inch sizes. It can also be purchased with an insert and can be purchased with INDOOR or OUTDOOR spun polyester fabric. Because this is a PREMIUM ARTISAN DESIGN, the pillow is made to order and ships in 3 to 5 business days. Prices will vary based on your selection of pillow size and well as whether or not you choose a pillow insert. Pricing has been determined by the supplier and not this Despicable Me merchandise review website. © 2017 DespicableMeBuys.com. All rights reserved.